It was Glen Hunting who brought my attention to Emily Bitto’s debut novel when we were commenting on the Miles Franklin longlist, and so I owe my discovery of this terrific book to him – thank you, Glen! Is there a difference between being an idealist serving a noble cause at the expense of your children, and being a bohemian doing the same thing in the service of art? Perhaps not to the children… but that’s a question for book groups to argue about, eh? Set in the Depression years and afterwards, the story is narrated by Lily, the observant, sensitive young friend of Eva, the middle child of Evan and Helena. Lily is captivated by the exotic elements of Eva’s home life: the freedom; the absence of routines; and the careless attitude to school and homework and rules. She compares the casual makeshift elegance and easy-going atmosphere of the Trenthan home with the placid conservatism of her less wealthy parents, and finds them wanting. She achieves her dream when difficult circumstances at home allow her to move in and live with the Trenthams for a while, and she believes that she is part of their world, the emerging world of modernist art in Australia. ‘Having you all around, ‘ Evan gestured to Ugo, Jerome and Maria, ‘has filled me with a very uncharacteristic sense of community. ‘Can’t say I’ve noticed that,’ said Bea. Helena shot her a look. ‘Just get to the point, Evan,’ said Helena. Patrick and Vera were exchanging perplexed glances. Now while I’m not entirely convinced that middle-class men of the 30s, bohemian though they be, used in front of women and children the kind of language that I have obscured above (in the interests of this being a family friendly blog used also by students at secondary schools) – I like the way this dialogue is structured, to undercut the pomposity of Evans without losing his sincerity. That’s skilful writing, IMO. Lily, observing all this, is excited because it offers the prospect of a place there for her too, but she is not to know then the price that the children paid for this unorthodox household. She does observe, however, that the littlest one, Heloise, is almost always in untended tears, and that housekeeping is a secondary concern. The Trenthams are not short of money, but their children are often hungry because no one has remembered to shop or cook for them. Indeed they seem so often to forget that they have progeny at all, that the children have to shift for themselves. Houseguest Lily sleeps on the floor, without enough bedding to keep her warm. There is a grubbiness about the house and a lack of organisation, and although Lily has come to despise her mother’s preoccupation with order and routine, she still has the occasional doubt. As does the reader when one of the artists wants the children to pose for him. The doubts grow greater when one of the young artists finds the nubile daughters ‘interesting’. Artistic ambition is a complex issue and it’s not always easy to be clear about when moral boundaries have been crossed. Artistic rivalry rears its head too, and loyalties are tested when the protégé outstrips the patron. 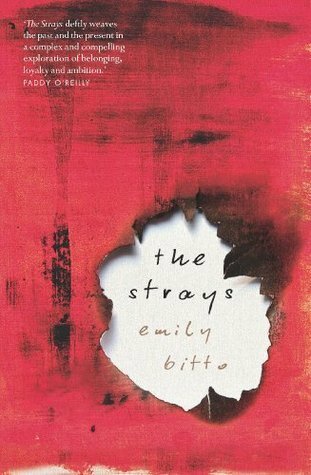 The Strays is an exceptionally good debut novel which deserves its nomination in the Dobbie Awards. I’m glad I’m not on the judging panel because I’d be hard pressed to choose between this one and Christine Piper’s After Darkness. (I haven’t read the other two, Foreign Soil by Maxine Beneba Clarke and Sideshow by Nicole Smith. No doubt they would make choosing even more difficult). I’m glad you’ve identified the historical echoes of the Reids within Bitto’s Strays. A dear friend gave me a copy of the collected letters of John Reid some years ago. The saga of the Heide group is truly fascinating. No, I think Helena is uniquely the author’s creation. And I liked her. I don’t think I would have liked Sunday or Cynthia. Have you read Autumn Laing? I loved the book, but I didn’t like her at all. No, I haven’t. Must do. And yes, you’re right; I wasn’t suggesting a direct ‘swipe from life’ with Helena (comparisons between fictional characters and ‘real people’ are quite often a reader’s own construction, anyway.) But aside from the obscenity trial, it’s the idea of an artistic collective that steadily becomes suffocating that represents the strongest parallel (for me) between the world of the novel and actual historical events. And that certainly happened at Heide. Yeah, I thought felt a bit of a disconnect with the behaviour of the parents too. Almost too laid back. I think that amongst some young writers who think it’s so hip to swear that they’re not even aware that they’re doing it any more, there is little awareness of the historical and contemporary contexts (especially international contexts) in which it’s just not acceptable, and therefore not at all authentic in the social settings of some novels. (It used to be – at least until the sixties – that certain words were only ever used by men or in abusive contexts, and the use of that language e.g. in pubs, professional and sporting clubs, tradesmen’s workplaces and even court trials was a way of excluding women. “You can’t be in here because you might be shocked by the words we use”. So in the 1970s feminists like Germaine Greer using “Anglo-Saxon” foul language was an empowering thing. But it’s not any more, because those battles have been fought and won. Today it’s just crass.